The Denver Nuggets’ (42-35) margin for error for the remainder of the season has dropped to almost zero as the team is still fighting for their playoff lives, but things just look a bit better – for now. With the regular season ending in less than two weeks and there still not being a single set matchup in the West, it’s safe to say that this has been as tight of a playoff race as seen in quite some time. It has resulted in an incredible race to end the year and, in a sense, an increased amount of games with intense playoff implications. Sunday was symbolic of that exact chaos. There are 10 teams with a chance to make the Western Conference playoffs. Three of those teams have already locked themselves into a playoff spot; the Houston Rockets, the Golden State Warriors and, of course, the Portland Trailblazers. To take a look at how close the Western Conference playoff race has really been, think of it this way; there are only two games separating the current fourth and eighth-seeded teams as of the morning of April 2nd. From here on out, every single game matters to every team. 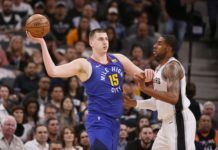 On Sunday night, the Denver Nuggets were a part of multiple games that had significant playoff-seeding implications as they were up against the East’s eighth-seeded Milwaukee Bucks. 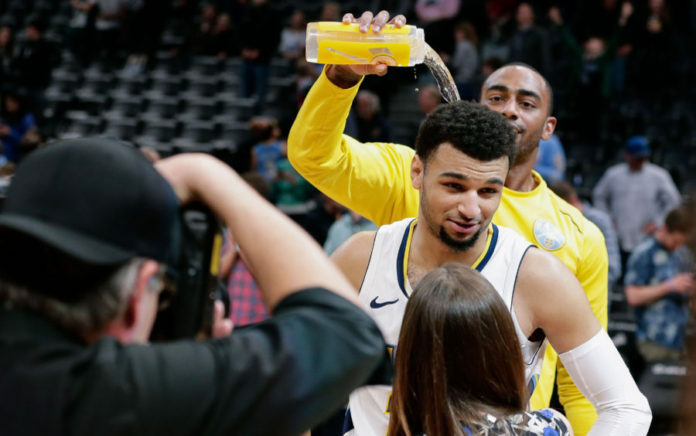 Denver was without starters Wilson Chandler and leading scorer Gary Harris, but — despite all odds being against them — they somehow managed to escape with an improbable overtime win. With 7:34 left in the game, all things looked to be going against Denver as they were down by 18 points with no answer for Giannis Antetokounmpo and Jabari Parker. But then Denver got their lucky break. After a 13-5 run to put Denver within 10, Giannis fouled out, and also was called for a technical foul as well for good measure. That gave much-needed momentum to Denver. After a strong push, Denver got the deficit down to 108-111 with a chance to tie it up with 5.8 seconds remaining in the game and in the most ‘Nugg-life’ way as humanly possible, Paul Millsap — who was having an incredible game — lost the inbounds pass and fumbled it out of bounds. The game appeared to be over as many fans walked to the exits, but suddenly, Jamal Murray appeared from nowhere to steal Khris Middleton’s inbounds pass, and was fouled on a three-point attempt that took what felt like an eternity to review. With 2.8 seconds remaining in regulation with the game on the line, Murray knocked down all three free throws to send the game to overtime. 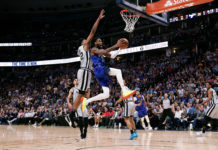 In overtime, without Antetokounmpo for Milwaukee, it was Denver that punched first and; although, the game still had its share of gut wrenching moments, it was the Nuggets that prevailed, capped off by a pair of Malik Beasley free throws to make Sunday an almost perfect day for the organization when thinking about all of the variables that were in play. Sunday was not only meaningful for Denver by securing their own win, but Denver finally received help from other teams. Other significant games on the night that worked in Denver’s favor were the Indiana Pacers beat the Los Angeles Clippers, which pushed the Nuggets into the ninth seed even before the game began. 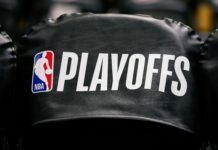 The New Orleans Pelicans also lost their fourth-straight game as they couldn’t get by Oklahoma City and, the biggest game of the night in terms of the Nuggets moving closer to a potential playoff berth was the Utah Jazz beating the Minnesota Timberwolves which gave Denver the ability to control their own playoff destiny. As long as Denver wins their last five games, they will make the playoffs regardless of what any other team does in the Western Conference. To put it simply, the Nuggets do not need the help of any other teams losing to make the playoffs. They just need to win the last five games of the season. Denver hasn’t been a team known for its great finishes as there’s been plenty of games they wish they could have back due to poor late game execution, but head coach Michael Malone understands that this team has grown. With only five games remaining, there is still a belief centered around this team and they’ll need that confidence. Denver has the opportunity to win out and put an end to their playoff drought and there is still hope in the locker room.